This week’s New Moon in Gemini (on Thursday 25 May) is stirring up some Duracell Bunny vibes. It’s the culmination of the energies we’ve been experiencing in the months leading up to May, which is technically a Number 5 month – numerologically, 5 is the number associated with dynamic growth through challenge and adversity. Thankfully, May 2017 adds up a Number 6 (which represents dynamism within stable confines), thus mitigating some of its potentially destabilising effects. For those of you who are wondering, it’s also why April 2017 was such an intense month. April 2017 numerologically adds up to 5, so if you experienced lots of ups and downs – with five retrogrades, no less – that was to be expected. Back to our New Moon in Gemini! If you’ve been feeling a little restless these past couple of days, New Moon energies could play a part – especially since this is a Super New Moon and La Luna is drifting by especially close to Earth, its proximity amplifying its vibrations of birth + rebirth, Gemini-style. Gemini is all about concepts and communication, so you might be feeling the impact of new (or revived) thoughts and ideas. Interpersonal engagements could be particularly vibrant; the mood is genial and expressive, with flashes of restlessness and irritability. You might meet a kindred spirit… keep your eyes and heart open. New Moon energies will be felt most keenly in the fortnight following the New Moon. The next two weeks are a great time to work on those new ideas that have been buzzing in your head – the closer to the New Moon, the better – so get on those awesome holiday plans and/or that brilliant business idea stat! 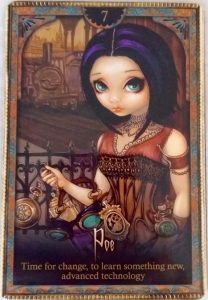 This weekend’s Oracle card is Poe, from the Oracle of Shadows & Light. When Poe appears, remember that change is the only constant in life. Change in itself is neutral; in order to evolve, learn and grow, we adapt to our environment effectively by making changes in positive ways. Sick of your job, or have a great idea to share? Communicate it – spread your message, write e-mails, make calls, send those resumés. Media + tech are your friends. If you’ve been dreaming of becoming fluent in Korean or expanding your web design skills to include UX, this weekend is a great time to sow your seeds of positive intent towards making good things happen. Do the research. Make enquiries. Sign up. Work on change, and be ready to receive the outcomes of your efforts when the Full Moon in Gemini arrives in six months’ time. Adapt to change. “Nevermore” is not an option. I love how Poe fits in so well with Gemini energies! Its focus on change + adaptation, education and technology are exactly what Gemini and its planetary ruler, Mercury, are all about. There’s no coincidence when it comes to Spirit.